As predicted in my earlier post on the auction of vintage computers which was due to take place in Germany on 25 May (Yesterday’s Computers – Tomorrow’s Antiques? ), the Apple-1 microcomputer did indeed fetch the highest price. It sold for a whopping $671,400, beating the previous record by over $30,000. The buyer was a wealthy entrepreneur from the Far East who wishes to remain anonymous. To make this story even more remarkable, the New York Times has since reported that the machine was sold by its original owner earlier this year for only $40,000. The unnamed buyer replaced some of the circuit board components to bring it back into working condition, got it signed by Apple co-founder Steve Wozniak (who also designed the Apple-1) and put it up for auction, making a huge profit in the process. In contrast to the Apple-1, the Scelbi-8H microcomputer sold for only $20,780 despite its greater historical importance and rarity, with only 3 examples thought to exist. The iconic MITS Altair 8800 sold for even less at $11,190, perhaps due to the larger numbers of these machines that are known to be in circulation. 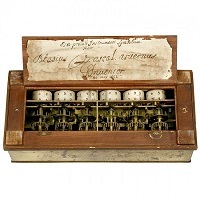 As for the beautiful Pascaline mechanical calculating machine, some careful detective work in the weeks leading up to the auction revealed that it was a replica dating from the early 20th century rather than a 17th century original manufactured by Blaise Pascal himself. Suspicion was raised when experts noticed that the handwritten label on the inside of the lid dating the machine to May 1652 looked identical to the label on an authenticated Pascaline in the Musée des Arts et Métiers, Paris. Further investigation showed that it had been assembled using screws with standardised metric threads rather than the handmade screws employed in Pascal’s era, confirming the machine’s 20th century origins. The auction catalogue was amended accordingly and the machine fetched $41,562 on the day, a very respectable price for a modern replica. What I didn’t realise when I wrote my earlier post was that the auction also featured an Alpina Universal Calculator identical to the one I own, suggesting that 20th century mechanical calculators are indeed worth collecting. However, I’m unlikely to make a fortune from selling my Alpina as the reserve price was only $700! This entry was posted in Computers as Collectibles and tagged Apple I, Blaise Pascal, Pascaline, Steve Wozniak on 10/07/2013 by Stephen J Marshall.